Hello, readers. Long time, no see. Things have been busy with me as of late so this blog has not gotten an update for a short while. Sadly, today is the day that I bring you my final blog post for my course titled “Technology in Education in the 21st Century.” It comes in the form of a journal review assignment wherein I had to research a journal that deals with education and technology in some form and critic it, along with providing basic information about the journal itself. It is quite similar to my website review that I posted a few weeks ago. Following this post, I am now on my own in terms of choosing content for this blog. I have ideas about the types of things I would like to write about and it will not revolve around technology as all of my posts have up until this point. I hope to cover various topics across the whole spectrum of TEFL/TESL/TESOL education. I may do spurts of themed posts if I think there are enough worthwhile reads from other classes or seminars that I participate in, but the point to take away from this is, I am expanding the horizons of this blog from here on out. Now, on to the journal review! 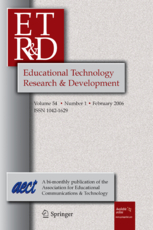 The journal that I choose to look at was Educational Technology Research and Development. The journal is a bimonthly publication and has been published since 1953 and is a publication of the Association for Educational Communications and Technology (AECT). The online editions are published by Springer and can be accessed here. “Educational Technology Research and Development is the only scholarly journal in the field focusing entirely on research and development in educational technology. I will start off by saying that, like many academic journals out there, the cost of reading articles is quite pricey. I am lucky enough to have free access to a number of journals due to my being a graduate student at Temple University. If you have no such affiliation, an article costs $39.95, €34.95, or £29.95, depending on your currency of preference. At the time of writing this journal review, they were offering a very tempting 30% off of all articles, bringing the price down to $27.95 / €24.50 / £20.95. Price aside, I did find this journal to be a source of very good articles. I read several from start to finish and skimmed a number of others. While I am sure that there are plenty of articles not worthy of consideration amongst all those written during the 60+ year life of the journal, the ones I read did not contain anything that I would be overly critical of. I found the wide range of topics in educational technology that are covered to be impressive as well. The journal covers emerging methodologies and models of learning aside from purely technology-focused subjects, but the bulk of articles that I came across revolved around the use of technology in education. Readers of this blog will be familiar with the topics of many of the articles that I looked at, including wiki mediated collaborative writing, social networking use in higher education, etc. One article that my classmates and instructor would appreciate was on metacognition and the influence of polling systems that compared clickers and low technology systems (clickers being the subject of a lecture done via Skype for one of our classes). I found the content of the articles to be quite intriguing and the methodologies were all seemingly sound, unlike some of those in other articles I have read for this course. Again, I read a mere sampling (about 10) articles from this journal, so my knowledge of its contents is, by no means, complete. I will, however, be looking at this journal for potential topics to discuss on this blog going forward. In fact, I found two articles on topics that I have yet to discuss that are potential game for just that. Wu, C. J., Chen, G. D., & Huang, C. W. (2014). Using digital board games for genuine communication in EFL classrooms. Educational Technology Research and Development, 62(2), 209-226. Santiago, R., Nakata, M., Einwaechter, N., Marschmeier, R., & Shimada, R. (1996). Integrating technology in the writing curriculum of Japanese learners of english as a foreign language. Educational Technology Research and Development, 44(3), 103-109. The first article discusses using digital board games in order to introduce genuine communicative situations into the classroom by using an interactive whiteboard and computer program that presents situations to pairs or groups of students that require them to interact in English in order to advance. At first glance, this does not seem to be something immediately applicable to most teachers as digital whiteboards are an expensive technology and most schools do not have the resources necessary to purchase one. In the future, however, this technology may become more readily available and so looking at how it can be used beyond as a more high tech version of a blackboard is interesting. The second article is something that is relevant to me as it discusses how typing versus handwriting pieces affects learners along with learner perceptions of typing versus handwriting. I have been playing with ways to allow my junior high school 3rd year students to turn in their weekly journal entries digitally starting in the 2nd term this year, as all of their entries in the 1st term were handwritten. After reading this article and looking at the results of the student surveys, I am even more enthusiastic about developing a system for such before the end of summer vacation. I hope to find more articles like this one that are relevant to my own current teaching situation. With such a long history, I am sure that more time spent searching this journal’s database will uncover such research. I also believe that research being published in this journal will continue to introduce ideas and concepts that are, at present, only in the early stages of development. The first article I listed mentions motion-controlled devices such as Nintendo’s Wii (and now there is also Wii U) and Microsoft’s Kinect (which also now has a new version) in it’s conclusion as something that is starting to be used in edutainment and that they are currently working on integrating motion controls into their own digital board game. Areas like this are what I expect the research in this journal will continue explore and help expand in the coming years. I recommend that, if you have the opportunity (or a considerable amount of money you do not have any particular use for), you check out this journal and some of its articles for yourselves. If you find something particularly interesting, do let me know and perhaps I can even cover the topic in a future post. Happy hunting! Hello again, readers. We are finally at the last two blog posts for my graduate school class, which means that once these are written, I must venture into unfamiliar territory and begin deciding the topics of my blog posts entirely on my own. It may take a bit for me to get things sorted out, but I will do my best to find things that are interesting and worthy of discussion without any help from those that know far more than I. For today’s penultimate article reflection, I will be looking at course management systems (CMS). I know that when I write that I do not have a lot to say on a subject I end up writing quite a bit, but this time it really may end up that way. I suppose we will see. For today’s post, I will be focusing on the paper by Houser and Thornton as well as referring to the CMS that I introduced in this blog post, Edmodo. Houser and Thornton (2005) are wrote their paper back in 2005, during a time before smart phones, and so much of what they discuss is about the limitations of the flip phones from that era. In particular, they talk about how they required developers to have a different way of thinking when writing programs or making web pages to be viewed on flip phones compared to standard computer screens. The smaller dimensions of the screen meant that large images, tables, and any sort of horizontal scrolling had to be eliminated in order to be easily viewed on mobile phones at the time (Previous work: Small screen displays section, ¶3). Of course, talking about such things now, in the age of smart phones and tablets, simply makes us thankful that technology has advanced so much in the past 9 years. The one thing that Houser and Thornton said that was as true now as it was back then is that the number of mobile phones greatly outnumbers that of personal computers (Motivation: Why mobile education? section, ¶3). Because of this, utilizing a CMS through mobile phones is an idea that I fully support and I am in the process of implementing in my classes right now. The paper talks about Poodle, a CMS for flip phones that had a number of basic but useful functions, especially considering the technological limitations. Poodle was able to poll a class or distribute a quiz that students could answer right on their mobile phones. Poll results could be converted to a graph that the instructor could then display for the class. A flash card function was also featured. In the paper, the authors talked about students using this function as a way of studying English vocabulary. I did feel that the paper went on an unnecessary tangent in talking about the various algorithms that flash card programs could use to decide the order in which words would appear, as this is not related to the main topic of course management systems (Poodle: A CMS for mobile phones section, ¶1-2, Flash Cards section, ¶3-7). Looking at Edmodo, a modern CMS, we can easily see the huge strides that have been made in this area over the past few years. Not only do the same functions seen in Poodle exist, they are far more complex. Multiple formats can be chosen for quizzes with Edmodo, for instance. Edmodo also has numerous functions that Poodle was not capable of. The most useful, in my opinion, is the assignment function. A teacher can create an assignment, attaching a file if necessary. A student can then complete the assignment and upload it to Edmodo, which will notify the teacher about the submission. The teacher can then view and assign a grade to the assignment right there on Edmodo and that grade can then be added into the separate gradebook function under that student’s name. Modern course management systems have the ability to make hard copies of assignments a thing of the past. Not only does this save paper, which eco conscious instructors will appreciate, it also saves valuable class time as no papers need to be distributed nor assignments copied off of the blackboard. Students also receive notifications when new assignments are posted on a class’ page so a quick reminder at the end of a lesson that homework will be posted to Edmodo is all that is necessary. While CMS technology has come a long way since Houser and Thornton wrote their article in 2005, I believe it has only scratched the surface of what it is truly capable of. With companies like Google now starting to formulate their own CMS component to work in conjunction with the rest of their applications, the future of course management systems certainly looks very bright. I highly recommend that anyone that teaches classes with more than a handful of students try integrating a CMS. Sites like Edmodo, with their companion smartphone apps, make teaching more efficient by allowing teachers to distribute assignments as well as receive and grade them at anytime from any location. Students, likewise, have the luxury of typing up assignments on a computer, tablet, or smartphone and submitting them even when, for example, riding a crowded train to or from school. Of course you can still offer hard copies to any students who do not have access to such devices or who wish to handwrite assignments, but for the others, having access to such a streamlined CMS is truly wonderful. Hello, readers. As you can tell from the title, I am going to be talking about handwriting in this post. This is a topic that I happen to be particularly interested in having recently taken a course on language assessment that dealt a great with test validity. Confused as to how the two relate? Let’s jump right into the discussion. I will be using the work of Mogey et. al. (2007) as the basis of this discussion, but this very subject was also raised as part of an in-class discussion on the validity of the testing practices at the institution where I am earning my masters degree months before I even read this article. The idea is that, despite the fact that a large percentage of students use computers or other electronic devices to take notes in class, type up assignments and papers, and communicate with their professor and classmates, when it comes time for students to be tested, the assessment is often in the form of a handwritten test that may require students to write long, essay-style responses. The question is whether or not this is still a valid form of testing as students are being asked to produce in a format that is different from that which they have been using in the course prior to the assessment. If you still are not sure what the problem is, picture it this way. You are taking a course on the fundamentals of swimming. You learn everything from the actual physics involved (the three types of drag that affect speed and all of that) to all of the various strokes. You cover a plethora of theories and learn about many of the great swimmers throughout history. Unfortunately for you, the final examination is 16 laps (across and back) around an Olympic-sized pool, which will be timed. At no time during the course of your class on the fundamentals of swimming did you actually get into a pool. Now perhaps you understand the concept of testing validity at the heart of the matter here (p. 39). I think this issue of validity is the most important one raised by this article and it is good to see some institutions taking it seriously. Other articles that I have come across have gone as far as asking whether handwriting and penmanship should even be taught anymore as most people do everything digitally nowadays. While I do not think that it will ever come to a point that we no longer write anything by hand, I do believe that the days of receiving physical mail and filling out paper applications are numbered. Despite this, for those rare times that we do wish to write something by hand, it will still need to be legible and so knowledge of handwriting and penmanship will be necessary. Think of how many artists and even children use words as part of their drawings. No, I cannot yet say that it is time to abandon handwriting as part of the curriculum in primary schools as it is still necessary in several areas not yet completely dominated by digital devices. Back to the issue of testing validity, the research by Mogey et. al. utilized a tablet PC and conducted an hour-long simulated test in order to gather feedback from participants on using the technology in place of a standard handwritten test. The tablet allowed for students to type their answers as well as draw in diagrams, charts, etc. as needed. One complaint about this aspect was that the tablet needed to be rotated when switching between typing and drawing, which served as a distraction during the simulated test. Of course, this is really only relevant to the tablet PC and software used in the research as I personally use an application on my iPad that allows users to switch between typing and free drawing with a touch of an icon (p. 44). One of the more interesting issues raised by one of the participants was that being able to go back and edit answers was a distraction. They argued that a lot of time might be wasted on rewriting answers, attempting to reorder sentences and come up with the best choice of words for what was already written, an option that is not as feasible with handwritten tests. Still another participant felt that handwritten essays were graded by instructors more leniently and that constructing a proper argument was not as important as getting as much information down on the paper. They argued that if tests were allowed to be typed, instructors would likely grade those tests against a higher standard similar to what is used for papers and reports written for the class (p. 44). One issue still remains for further research, although it is likely to be a factor of whether individual instructors are more lenient with students having to handwrite a test in one go without any real chance for revision. That issue is whether allowing students to use electronic devices to type up their tests will result in a different score than if they did it by hand and, if so, whether that score is a better measure of the student’s ability. I believe that if such research is conducted, it will show that students who choose to type their test will likely deliver a better performance than those who would prefer to type their test but are forced to do it by hand. Note that I am taking preference into account and not saying that all students will perform better given the chance to type out their responses. I, personally, can type faster than I can write and my hand quickly tires during the course of a three hour essay test. If it is the case that such tests are about putting down as much information as you can on a given subject, than I am being limited by how fast I can write and may not have time to write down all that I know about the topic. I have found that I often pause during such tests due to muscles in my hand cramping and that my writing speed slows as the test progresses. Several of my classmates similarly complained during the discussion that took place during one of the classes for the language assessment course (p. 45). It is good to see that some institutions are starting to allow students to use technology to type answers to test questions, but I agree that more research is needed. Despite my own preferences, I see the need for ascertaining whether the format of the test has any impact on students scores, whether from bias in the form of leniency on the part of the grader for responses that are handwritten or simply because the student is able to perform better given that they are being tested using the same medium with which they performed all other tasks for the class. What do you think of this particular subject, readers? I know I primarily focused on the topic of the validity of written exams, but I am just as eager to hear opinions on whether handwriting should still be taught in schools if you should happen to think there is no need. Sound off in the comments or feel free to share this post with others that might find it interesting and worth considering.